Port Authority's customizable full length apron is perfect for cooking, grilling out at the BBQ, crafts, painting and more! Made with a poly/cotton blend to keep you safe from any mess, and for easy care. Also features a unique fitting system that allows for a tailored look by pulling a single strap. Customize this apron for yourself, or for a gift! Adjustable. Top and side straps are all one strap that can be pulled back and forth. 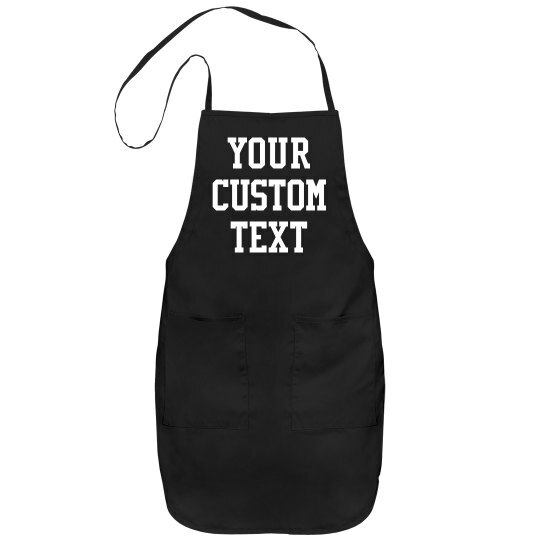 Customize you very own apron with a funny message or saying of your choice! This awesome full length apron will be a great gift for someone who loves to cook or bake! This full coverage apron can also serve as an awesome art smock for a creative genius in your life. Just personalize the front by adding your own text!